I’ve got a hankering for another word list. This time, let’s make a list of Hawaii foods. Notice I didn’t say “Hawaiian” foods, because not all the foods on this list are part of the traditonal, Native Hawaiian luau (although I’ve included those, too). Many are adopted from the cultures of immigrants who’ve settled here, such as the Japanese and Portuguese. One of the best things about living in Hawaii (or just visiting Hawaii, for that matter) is discovering foods you’ve never heard of before and tasting them for the first time. Since I moved here, my new favorites are acai bowls, chicken long rice, huli huli chicken, lau lau, haupia, lilikoi, malasadas, mochi ice cream, opah, and shave ice with azuki. I’m sure I’ve forgotten to add some foods to this list, so if you have any additions, please leave a comment! acai bowl (ah-sigh-EE bowl) – Frozen acai-berry puree blended with soy milk, apple juice, or some other liquid to create a fruit-smoothie consistency. Served in a bowl and topped with granola, fruit (usually sliced bananas, strawberries, and blueberries), and sometimes honey and shredded coconut. Dee-licious at any time of day. If you want to try an acai bowl, I recommend Diamond Head Cove Health Bar and Blue Hawaii Lifestyle‘s cafe. ahi (AH-hee) – Yellowfin tuna or bigeye tuna. Usually served raw or seared. apple bananas – A variety of banana that is about half the size of the bananas you typically see in grocery stories on the U.S. mainland. Has a slightly acidic, apple flavor. azuki (ah-ZOO-kee) – Sweetened red beans that are typically used as a mochi filling, ice cream flavor, or shave ice topping. Blue Hawaii – A cocktail made of light rum and/or vodka, blue Curacao liqueur, sweet-and-sour mix, and pineapple juice. Served over ice or blended with ice. Invented in 1957 by Harry Yee, bartender at the Hilton Hawaiian Village. chicken katsu (chicken KAHT-soo) – Boneless chicken cutlet that is breaded, fried, cut into strips, and served with a sweet dipping sauce. chicken long rice – Shredded chicken and “long rice” (actually bean-thread or “cellophane” noodles) in chicken broth flavored with ginger and green onion. Traditionally served at luaus. If you want to try chicken long rice, I recommend Ono Hawaiian Foods. 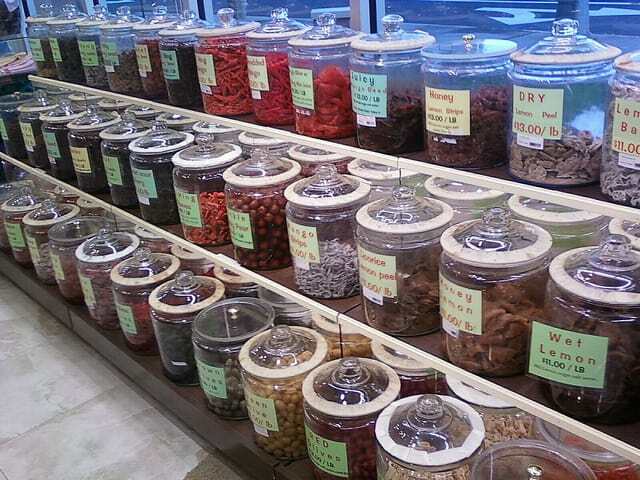 crack seed – Preserved fruits, dried cuttlefish, and crackers that are eaten as snacks. Li hing mui is a popular type of crack seed. guava (GWAH-vah) – A tropical fruit that is commonly used in jams, syrups, fruit-juice blends, breads, and cakes in Hawaii. It is also sometimes eaten as a whole fruit, dipped in a mixture of vinegar and shoyu. guri guri (GOO-ree GOO-ree) – A frozen dessert that’s similar to sherbet. If you want to try it, Tasaka Guri Guri at the Maui Mall in Kahului is very popular. haupia (HOW-pee-ah) – Coconut-milk pudding that is usually cut into blocks resembling Jello cubes. Traditionally served at luaus. Haupia is also used as a filling in pastries. huli huli chicken (HOO-lee HOO-lee chicken) – Barbecued or rotisserie chicken basted with a teriyaki-like sauce. The name and special sauce was invented in 1955 by Ernest Morgado of Pacific Poultry Co. Huli huli chicken is commonly sold at roadside grills and Hawaii supermarkets like Foodland. kalua pork (kah-LOO-ah pork) – Pork (traditionally cooked as a whole pig) that is rubbed with salt and herbs, wrapped in ti and banana leaves, slow-roasted, and served shredded. Traditionally, kalua pork is cooked in an imu (underground oven stoked with kiawe wood) and served at luaus. kava (KAH-vah) – Also called awa. A traditional Hawaiian drink made from grinding or pounding the roots of the kava plant. Produces a feeling of relaxation, well-being, and mental clarity. If you want to try kava, Diamond Head Cove Health Bar has “Awa Nights” every Tuesday, Wednesday, and Thursday. kukui nut (koo-KOO-ee nut) – The nut of the official state tree of Hawaii. Kukui nuts are roasted, pounded, and mixed with salt and limu to produce inamona, a seasoning used in poke. lau lau (rhymes with OW OW) – Boneless pork, beef, chicken, or fish that is wrapped in ti or taro leaves and steamed. Traditionally served at luaus. If you want to try lau lau, I recommend Ono Hawaiian Foods. lehua honey (leh-HOO-ah honey) – Honey made from the blossoms of the ohi’a tree. Has a creamy, spreadable consistency. li hing mui (LEE HING MOO-ee) – Traditionally, dried plums in a sauce of sugar, licorice, and salt that are sold at crack seed stores and eaten as a snack. Li hing mui is also used to refer to the flavor of the sauce, which is now used in powder form as a seasoning for other foods — for example, li hing mui dried mango. lilikoi (LIL-ee-koy) – Passionfruit. A fragrant fruit commonly used in Hawaii to flavor jams, syrups, beverages, shave ice, ice cream, and pastries. limu (LEE-moo) – Sea algae. Commonly used to season poke. loco moco (LOH-koh MOH-koh) – White rice topped with a hamburger patty, a fried egg, and brown gravy. Commonly served as a breakfast or plate lunch option. lomi lomi salmon (LOH-mee LOH-mee salmon) – A mixture of diced fresh tomatoes, onions, and raw salted salmon. Served cold. Traditionally served at luaus. lychee (LIE-chee) – A bumpy, reddish ping-pong-ball-sized fruit with a fleshy, edible interior similar in look and texture to a peeled grape. Has a distinctive, perfume-y flavor. Commonly eaten as a fresh fruit and used to flavor beverages, shave ice, and ice cream. macadamia nut (MAC-ah-DAME-ee-ah nut) – A creamy-textured nut grown as a crop in Hawaii. Commonly eated alone and used in candies, pastries, and as a coating for fish. mahimahi (MAH-hee-MAH-hee) – Dolphinfish (not related to dolphins). Commonly served in Hawaii. mai tai (MY TIE) – Cocktail consisting of white rum, dark rum, orange curacao liqueur, Orgeat syrup, sugar syrup, and lime juice. malasada (mah-lah-SAH-dah) – Portuguese pastry very similar to a donut, although slightly smaller and without a hole. Traditionally covered in granulated sugar. I recommend trying these at Leonard’s Bakery and eating them while they’re still warm — if you save them for later, they won’t taste as good, even if you try reheating them. In my opinion, the plain-sugar or cinammon-sugar ones without any filling are the best! mango – Sweet, juicy stone fruit with flesh similar in texture to a peach. Commonly eaten alone (fresh or dried) and used in fruit-juice blends, teas, chutneys, candies, and pastries. Grown as a crop in Hawaii. mochi (MOH-chee) – Japanese pastry made of pounded glutinous rice that is lightly sweetened, flavored, and molded into shapes or cut into squares. Sometimes filled with azuki paste. Mochi is also used to form a soft shell around a ball of ice cream. If you’re interested in trying mochi ice cream, I recommend Bubbies. opah (OH-pah) – Moonfish. Commonly served in Hawaiian restaurants. Dee-licious. pao doce (POW DOH-chay) – Portuguese sweet bread. papaya (puh-PIE-uh) – Tropical fruit with a fragrant, fleshy interior similar in texture and taste to a cantaloupe. Commonly eaten alone (fresh or dried) and used in jellies, teas, juice-blends, and salads. Grown as a crop in Hawaii. pineapple – Commonly eaten alone and used in jellies, juice-blends, pastries, and to flavor shave ice and ice cream. Grown as a crop in Hawaii. pipi kaula (PEE-pee KOW-lah) – Beef that is marinated in brine (and sometimes soy sauce, sugar, pepper, ginger, sesame seeds, and other varying ingredients) and then air-dried. Similar to beef jerky, but chewier and still slightly moist in the center. plate lunch – Also called mixed plate. A take-out meal traditionally consisting of two scoops of sticky white rice, a scoop of macaroni salad, and a main entree. Main entree choices usually include chicken katsu, lau lau, kalua pork, barbecued beef or chicken, short ribs, beef stew, shrimp, fish, etc. Modern variations of the classic plate lunch substitute brown rice for white rice, green salad for macaroni salad, an additional entree for one of the scoops of rice, etc. If you want to try a plate lunch, I recommend Rainbow Drive-In. poi (POY) – Cooked corm (underground stems) of the taro plant that have been mashed into a thick, pudding-like consistency. Traditionally served at luaus. poke (POH-kay) – Cubed raw fish (often ahi), shellfish, or octopus mixed with salt, shoyu, crushed kukui nuts, sesame oil, limu, chopped chili pepper, and sometimes other seasonings. Commonly served as pupu, or on top of rice as a meal (“poke bowl”). Portuguese bean soup – Kidney beans and sliced Portuguese sausage in a tomato base flavored with ham hocks, along with other varying ingredients, such as cabbage, onions, potatoes, carrots, celery, chickpeas, bacon, and macaroni. Commonly served at festivals in Hawaii. Portuguese sausage – Cured pork sausage seasoned with garlic and paprika. Commonly served at breakfast. Also a key ingredient in Portuguese bean soup. pupu (POO-poo) – Appetizers or hors d’oeuvres. Common pupu in Hawaii include poke, tempura vegetables, shrimp, edamame (boiled soybeans in pods), sushi, and teriyaki meat skewers. saimin (sigh-MIN) – Ramen-like noodle soup with varying additional ingredients such as green onions, Portuguese sausage, eggs, cabbage, Spam, nori (seaweed), and fish cakes. shave ice – Somewhat similar to a snow cone, but much more finely textured (because the ice is shaved rather than crushed). Syrup toppings are commonly tropical fruit flavors, and sometimes condensed milk is used as an additional topping (called a “snow cap”). Sometimes served with a scoop of ice cream or azuki paste in the bottom of the cup/bowl. Whole azuki beans are sometimes sprinkled on top, as well. I recommend Waiola Shave Ice. shoyu (SHOY-oo) – Soy sauce. In Hawaii, it’s almost always called shoyu. Spam – Precooked, canned meat product manufactured by Hormel Foods. It is commonly served grilled or fried as part of breakfast meals, lunch plates, and in Spam musubi. It was introduced to the Pacific Islands during the U.S. military occupation of WWII. Hawaii is the second-largest consumer of Spam per capita (Guam is first). Spam musubi (Spam moo-SOO-bee) – A palm-sized block of sticky white rice topped with a slice of grilled/fried Spam lunchmeat, held together with a strip of nori (seaweed). Sold at grocery stores and convenience stores throughout Hawaii, including 7-Eleven. Popular as a snack or light meal on-the-go. taro (TAH-row) – A plant whose corms (underground stems) are mashed to make poi and whose leaves are sometimes used as a wrapping for lau lau. Also used as a flavoring for breads and ice cream and as a filling for pastries. Taro is also thinly sliced, fried, salted, and sold in bags like potato chips. Grown as a crop in Hawaii. ti (TEE) – Also called ki. A plant whose leaves are used for wrapping kalua pork and lau lau. Its roots can be fermented and distilled to make okolehao (Hawaiian “moonshine” liquor). ulu (OO-loo) – Breadfruit. A traditional staple food of Native Hawaiians. Ulu is roasted, baked, fried, or boiled (much like a potato) and is often combined with coconut milk. Mashed ulu is sometimes used as a substitute for (or in addition to) taro in making poi, resulting in poi ulu.